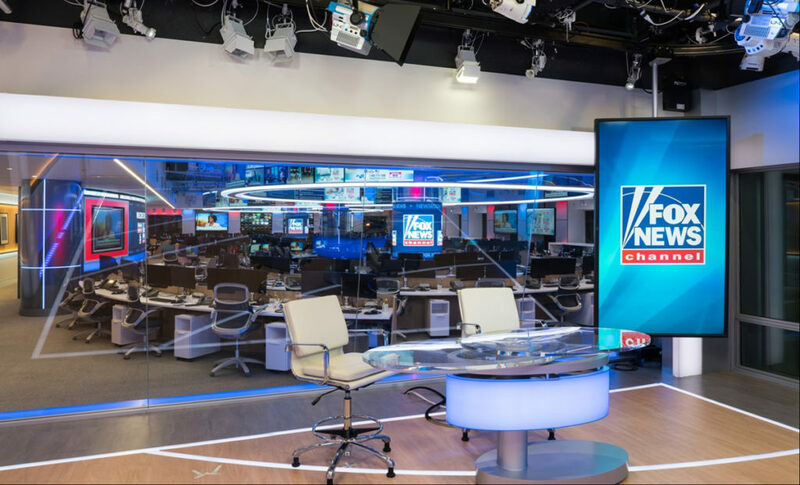 Fox News Channel opened its new combined newsroom at its New York City headquarters this morning. The network officially cut the ribbon on the new second floor newsroom that provides a lighter, more airy space for collaboration. The space spans 7,600 square feet and includes an adjacent studio, dubbed Studio N (“for ‘news'” as anchor Bill Hemmer noted shortly after the ribbon cutting). 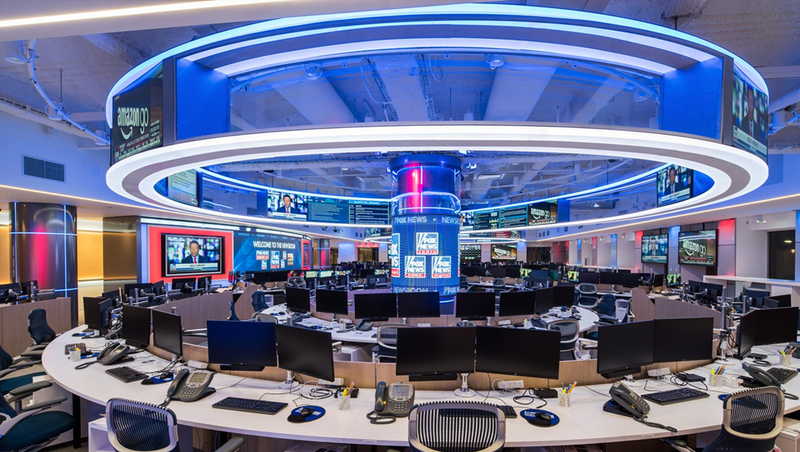 The final layout and look of the new space appears to largely match the look of the renderings Fox released in May 2017 — with circular LED pillars and a snaking header element with built in flat screens allow staffers to monitor a myriad of video and data feeds. Studio N. Images courtesy of Fox News. Much of the workstations are placed around ring-shaped desks. In addition to providing a more centralized work area for the network’s core newsgathering staff, the space also boasts large windows in both the newsroom and studio. Studio N, meanwhile, features a glass topped circular anchor desk set against slanted windows overlooking the space along with a large vertical flatscreen. As of now, Fox News says no shows are slated to originate from Studio N on a regular basis. Many of the network’s programs originate from Studio F, a two story streetside studio the network debuted in November 2016. Previously, the channel’s newsroom was in the basement of the News. Corp. building, with the space previously used as an executive suite, including the “formal” office for late chairman Roger Ailes. Jack Morton Worldwide designed the studio with Gensler Architecture serving as architect. The Lighting Design Group lit the space.